RWYK Author Interview with Jodi Stapler & Phyl Campbell!! In this extra episode of the Reading with your kids Podcast, We’d like to welcome not just one but two very talented authors to talk about their wonderful contribution in children’s literature and their latest children’s books which are ready to inspire and encourage kids to be kind, respectful and accepting fo each other. Tune in to join us in welcoming back authors Jodi Stapler & Phyl Campbell to the Reading with Your Kids podcast! 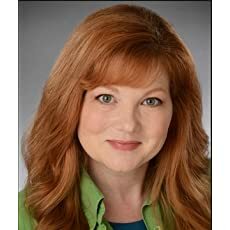 Jodi Stapler is an eccentric mother of 4 who daydreams about being Laura Ingalls Wilder or Anne of Green Gables. Her ideas, creativity, and imagination disrupt, annoy and hopefully, entertain her family and those around her! 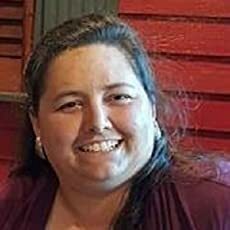 Jodi is a counselor, teacher, scout leader and coach residing in Lancaster, Pa.
Jodi is the owner at Willow Moon Publishing. Her company works to provide access to quality books that all too often are overlooked by the “Big 5”. Their goal is to help authors who tell engaging, dynamic, and compelling stories get their work into the hands of readers. Phyl Campbell is Author, Mother, Dreamer – according to her blog, anyway. She’s been writing since she was old enough to pick up a pencil. This is her second published book for middle-grade readers, the first being A Muse Meant, published in 2015. In addition to books for middle-grade readers, Phyl Campbell has published many books for adults and young children. In addition, she heads the Young Authors program, getting authors as young as six published on Amazon. Phyl is a picky eater who spends way too much time playing games and reading articles on Facebook. She has a great personal library that could never have too many books but frequently runs out of shelf space. Questions or comments for Phyl Campbell can be asked via her webpage www.phylcampbell.com, her blog www.phylcampbell.blogspot.com, or via the PhylCampbellAuthorPage on Facebook. PhylCampbell.com and the CreativeWritingAnd PublishingWorkshop Page on Facebook can help future authors connect with Phyl for support on their own projects. Believe that the world needs your stories! 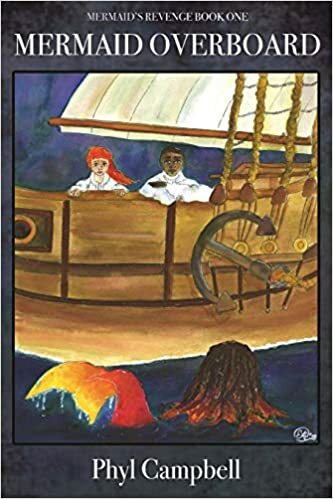 What if mermaids are women discovered on sailing ships? Superstitious sailors tied them up and threw them overboard. Bound legs became powerful tails. The women begin new lives underwater as mermaids. Mandy disguises herself as a boy on the Bold Fortune to find information leading to the rescue of her father. But when Captain Cutler tells Adam to befriend and betray her, can their friendship chart a different course? Or is Mandy doomed to join the mermaids overboard? How did Jodi get the idea to write her latest book “Pepper Miss Pepperoni Fins Someone to Love Her ” and the inspiration behind the story? What exciting things these authors have planned for their upcoming projects and much more. Grab a cup of coffee or tea, sit back, and enjoy the interview! A big thank you to Jodi Stapler & Phyl Campbell for joining us and for sharing their wonderful books with us! So, there you have it. 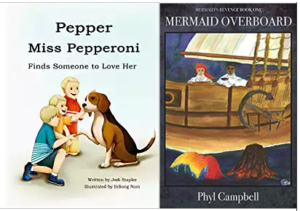 We’re sure you’ve enjoyed learning about Pepper Miss Pepperoni Finds Someone to Love Her and Mermaid Overboard (Mermaid’s Revenge) (Volume 1) as much as we did! If you’ve enjoyed this episode then please rate and review our show on iTunes and share it by clicking the social media buttons at the bottom of this page! Previously“Let’s Make Yoga Magic” with Heather Leah! !